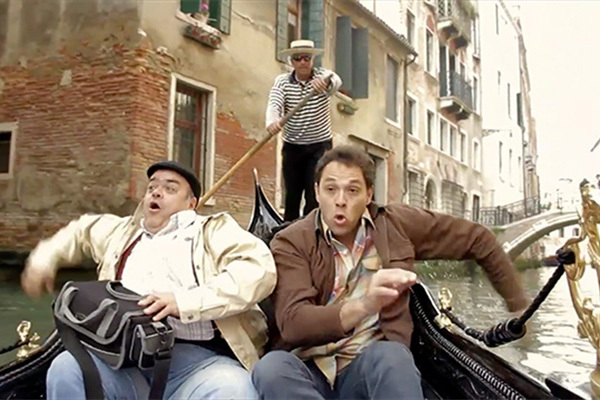 “Sapore D’Italia” is a comedy of customs narrating the adventures of an unusual duo of reporters from Serra Gaucha overseas in Italy. The main character is Marco, an inept reporter who works at a small video production company in Bento Gonçalves. His best friend is Simone, a gluttonous Italian who’s been living in Brazil for 30 years, and the owner of a cafeteria on the brink of bankruptcy, as well as a part-time photographer. Both their lives change completely when they get a big break: the chance to direct a TV show about tourism in Italy. After arriving, Marco and Simone will find themselves embroiled in various absurd situations, due to their lack of skill and professionalism. Then along comes Francesca, a beautiful Italian woman who will make her way into Marco’s heart and change the course of their journey. The entire trip, with its ups and downs, will see the duo discovering a far different Italy than the one they had imagined, and finding new purpose for their lives. RBSTV’s first international fiction miniseries, “Sapore D’Italia”, aired its five episodes between August and September of 2011, with an estimated one million viewers per episode. In 2012, the series was broadcast on Globo Internacional in over 100 countries in Europe, Asia, Africa and America. Sediada em Porto Alegre, a Coelho Voador é uma das primeiras produtoras de roteiros do Brasil. Atuando desde 2009, a casa é focada no que faz bem: confeccionar roteiros audiovisuais de qualidade.